Photography is all about how you capture the light, at night time you’ll be capturing artificial light. 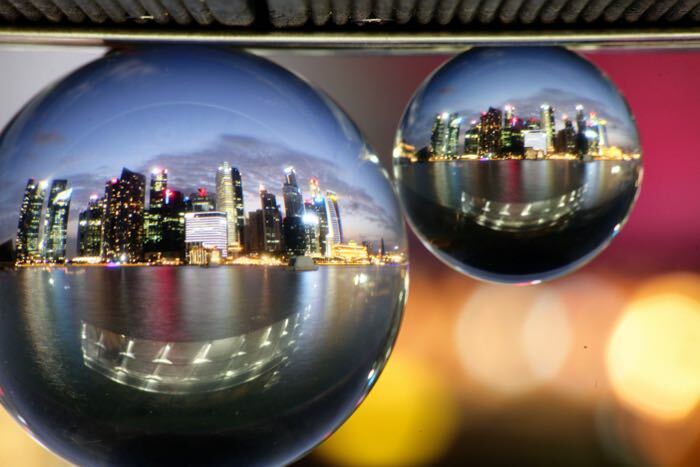 This is a fascinating time to take photographs, and in today’s article you’ll learn how you can do that with your lensball! A lot of what you do during the day will be the same, but lensball night photography presents a few challenges and some opportunities! 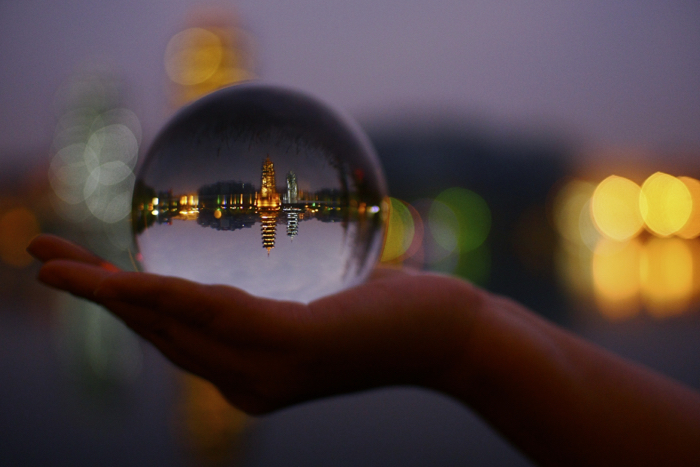 Read on to discover how you can get the best photos with your lensball. One of the best times to take photos with your lensball is at night. Your lensball acts as an external lens optic. At night time the way your ball interacts with man-made lights will make or break your photo. When practicing lensball night photography consider the following. 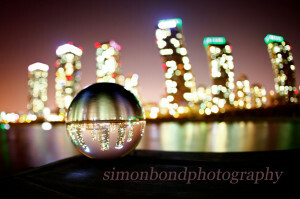 Upside down – Your image will be upside down, this will still be the case for night lensball photography. Work with this constraint, and you can use it to your advantage. Long exposure – As the light fades the need for longer exposures increases. In some cases that may make certain lensball practices like holding the ball impossible. High noise – If there is enough light you will still be able to hold the ball. The cost will be using a high ISO, and the consequent noise this produces. Use programs like noise ninja and dfine to mitigate this. Light source – You’ll need to have a strong light source in front of the lensball. This light source would ideally fill the frame of a wide angle lens. Reflection – Depending on where you photograph you can get strong reflection on the surface of the ball. As with daytime photography, you’ll need to avoid strong light source behind the ball. Standing in a well lit corridor or street could lead to lots of undesirable reflections on the surface of the ball. To improve the photo it’s sometimes possible to block a background reflection. Note the lensball on the left has a reflection at the top of its surface. Using something to block this reflection, the lensball on the right has a much reduced reflection. The key to all forms of photography is proper selection, and framing, of your main subject. At night not all subjects will work as well, it all depends how well lit it is. In general you’ll have better luck photographing at night in the city, but photographing in the wilderness can also work. Architecture – A great subject for lensball photography is large scale architecture. Often the most iconic of these is illuminated at night, making it a good choice. Keep in mind that the level of light could be overpowering, so aim to photograph during the blue hour when you can control this light more. 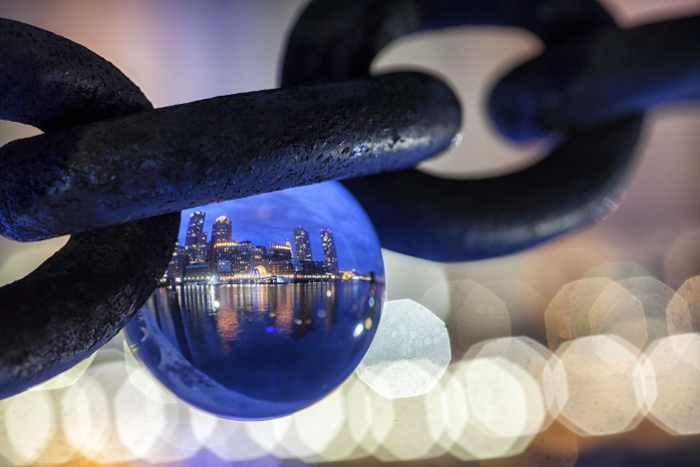 Cityscapes – A well lit city is an excellent choice for lensball night photography. It’s usually best to avoid photographing these from a distance though, as the cityscape will then be small within the ball. Instead find a vantage point within the city, that allows you to fill the ball with the cityscape behind it. Traffic – Traffic light trails make a good subject, of course you’ll need a long exposure. That means securing the ball in a location close to a road, that allows you to take this type of photo. Take care that the ball doesn’t roll out of position, and onto the road where it could be dangerous. Astrophotography – With the right lens setup it’s also possible to take photos of the milkyway with a lensball! Milkyway photography is a niche, and you’ll need to find a dark location to practice this. 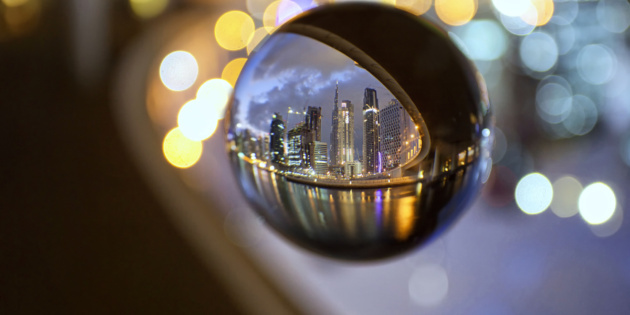 This photo shows the potential of the lensball to capture a wide night time cityscape, this image was taken in Shanghai. One of the most pleasing aspects of lensball night photography is the ability to produce bokeh. This is much easier at night, where you’ll likely have lots of background city lights to work with. This bokeh can really add to your photo, as it creates a smooth pleasing background. You can control this bokeh by using your aperture. The larger the aperture is, the larger the background balls of light will become. A lot of the time this bokeh will act as a smooth panel background, but there are times bokeh can be used as a leading line that leads up to the ball itself. The bokeh background is a big part of lensball photography. Here a ferris wheel provides lines of light thoughout the photo, a ferris wheel like this makes an excellent main subject. Holding the ball and photographing it is tricky during the day, it’s even trickier to do this at night. If you need a tripod to take the photo, you’ll also need a steady place to put your ball as well. You have the potential for camera shake, and lensball shake! A shaky disaster for photography, but are there solutions? Shutter speed priority – To avoid shake from both the camera, and a hand holding the lensball you’ll need a fast enough shutter speed. At night this will mean using a lens with a large aperture, which is wide open, and a high ISO. Even with ISO and aperture set to their maximum, you may find the shutter speed is still too slow. It’s not a good idea to photograph below 1/40th, but you can try. Blue hour – If you’re struggling to photograph because it’s too dark why not photograph earlier? Blue hour is an excellent option. You’ll get the best of those city lights in the background, and in your ball. You’ll also now have enough light to hold the ball, and take the photo. It’s possible to hold the ball and get a fast shutter speed at night. You just need the right settings, and to photograph during blue hour. 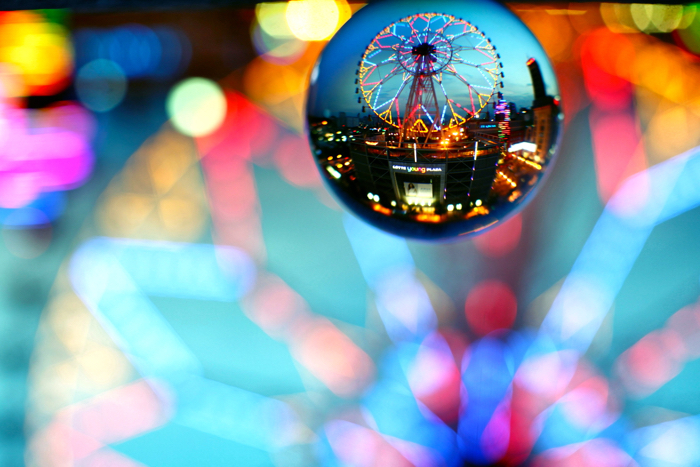 A lot of night photography will require a tripod, and lensball photography is no different. Any exposure that requires a shutter speed longer than 1/20th should really be taken from a tripod. If you’re using a 100mm macro lens, then 1/50th and slower really needs a tripod. In addition to the camera being on a tripod, the ball will need to be on a steady resting place as well. On the floor – With the ball placed on the floor it can be tricky to get the camera down to the correct angle to take the photo. You could attempt to take the photo without the tripod, placing the camera on the ground as well. Alternatively use a tripod that allows the camera to get down to a position level with the ball. A gorilla pod can do this, or a tripod that allows you to invert the central pole, so the camera is underneath the tripod. Elevated position – The ball is placed on a surface such as a wall. Now it’s just a case of lining up the camera on the tripod, so it’s level with the ball. 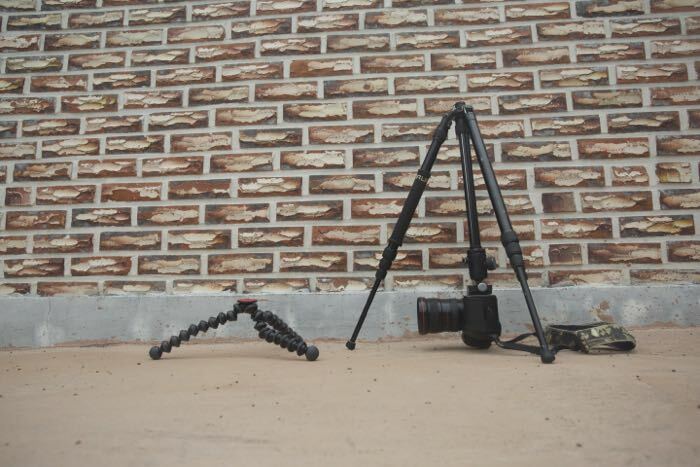 On another tripod – If you have two tripods you might consider putting the ball onto one tripod, and the camera on the other. When your lensball is placed on the ground, you need to get your camera down to the correct angle. Inverting your tripod, or using a gorilla pod are both ways to achieve this. One of the best and most creative night time photography techniques you can try is light painting. This can be combined with lensball photography to great effect, and lead to some interesting results. You’ll need to have both camera and ball steadily positioned, and then the creativity can begin! Wire wool – A simple wire wool spin behind the lensball can provide an interesting photo. Sparks flying into the foreground of where the ball is placed, while the main spin is picked up within the ball. Light stick – Light sticks are another great option for light painting. You’ll need to balance being close to the ball, but not overpowering the whole frame with light from your light painting device. Still life – Get a macro lens, and try some still life at home. Place a glass panel on a table, bend a piece of wire for the ball to sit on, and turn the lights off. Now light paint behind the ball for amazing results! 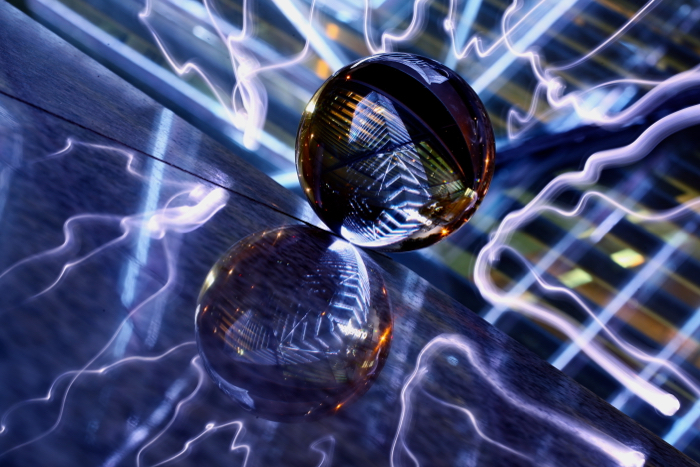 Light painting, especially when the lensball is on a reflective surface, is a lot of fun. Night time photography broadly comes in two phases. The blue hour, which gives you a better ability to control the light. Then after blue hour once it’s fully dark you have more contrast in your photo, and the need for longer exposures. Blue hour – This is a great time for photography, especially landscape photography. When it comes to lensball photography you’ll have a better chance of hand holding your ball during this time, yet still have city lights as bokeh in the background. The earlier into blue hour the easier it will be to hold the ball, and keep a fast shutter speed. Yet the best photos will come when you get that really deep blue, usually about 20 minutes after sunset. Night – The night offers a different type of scene, one that can be equally dramatic. You’ll want to have a strongly lit main subject to gain a fast enough shutter speed. It can be possible to hold the ball in your hand, but it’s best to place the ball on a surface somewhere, and take the photo with the camera mounted on a tripod. At this time there will be a high level of contrast between objects that are lit up, and those which are not. 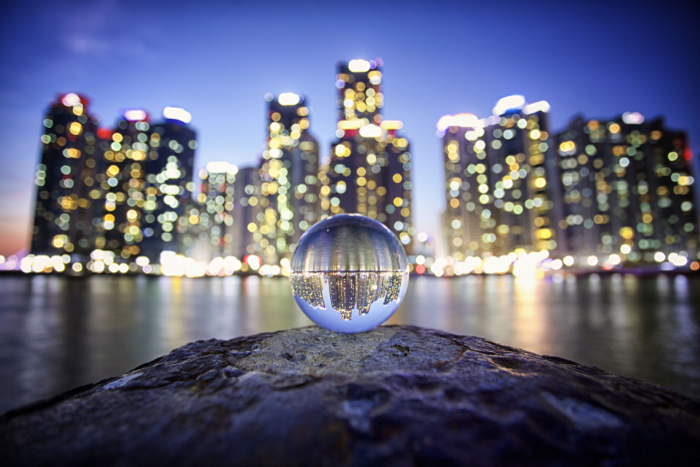 It’s a good idea to photograph cityscapes during blue hour, using a crystal ball to do this doesn’t change this fact. 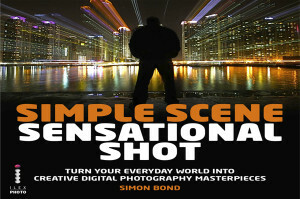 Create your lensball night photography! Discovering the different ways you can take a photo is what makes photography fun. Now you’re ready to take the best lensball night photography, and to really add to your portfolio. 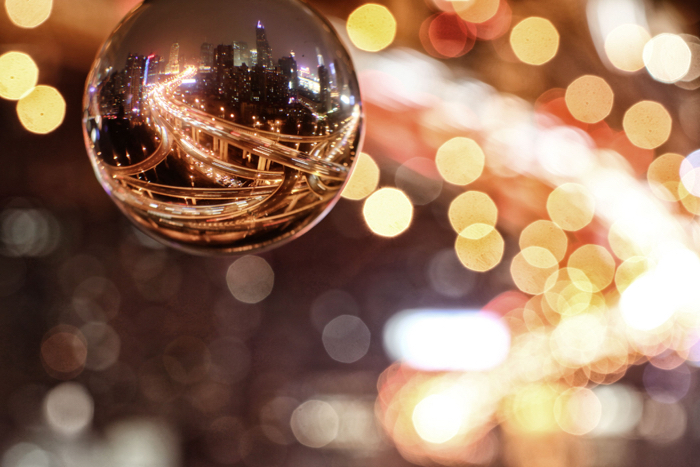 Have you practiced lensball night photography before? Did you find it challenging? Are there different techniques which you practiced at night? As always at creative photography school we’d love to hear your opinions, and for you to share your photos in the comments section. 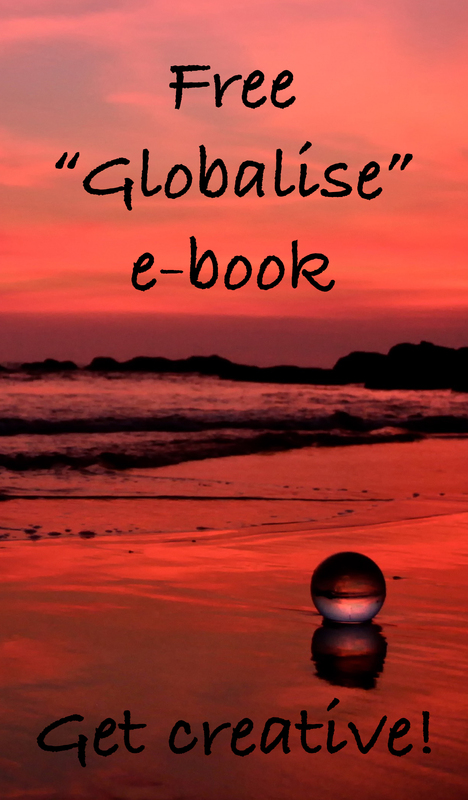 Do you want to go Global! 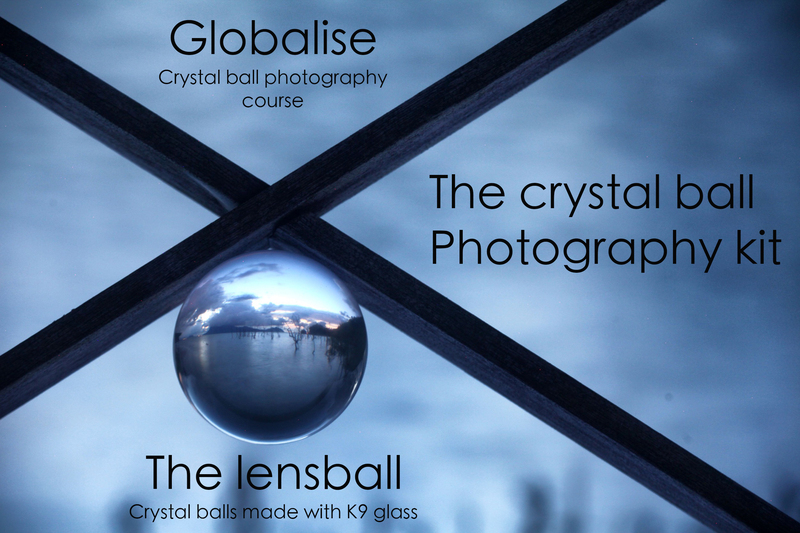 Here at creative photography school I’ve created a course all about lensball photography. I’ve a wealth of experience in this niche genre which I want to pass on to you. I hope you’ve enjoyed this blog, and if you want to learn more then this is a great course for you!